WE DID A READING recently of a play I was always told was mere escapism. The drama turned out to be slightly more significant than that, being set in an old mansion whose staff gently meet clients’ escapist fantasies, such as a trade union leader working, and never finishing, his revolutionary tract. A ballerina dances late in the proceedings. The play won the first Adelaide Festival of Arts play-writing competition in 1960. I was young, but enjoyed that short opening season, which was probably its last, until we gave Goodbye to Number Six its recent airing. 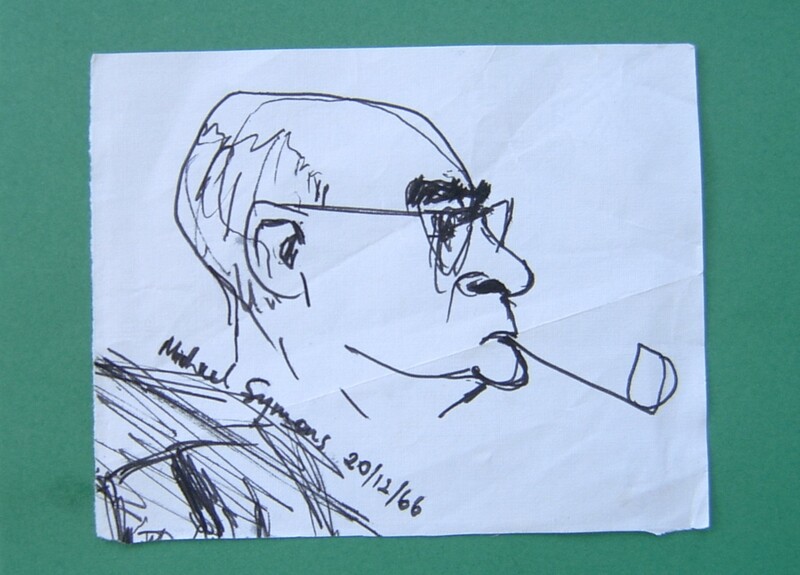 Our interest came from its author being my grandfather, Alex Symons. 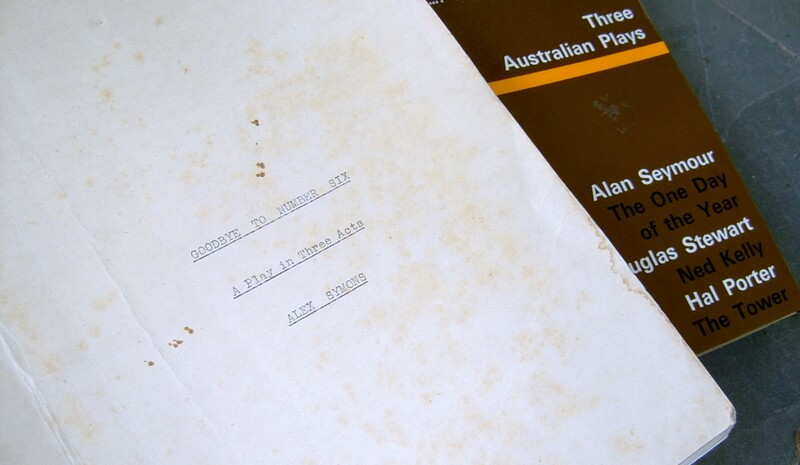 Detracting from family pride, however, the play had only won and been performed because the conservative board running that first festival had over-ruled the experts’ recommendation, which eventually proved to be one of Australia’s most enduring plays, Alan Seymour’s The One Day of the Year. I attended the world premiere of that, too, put on by many of the same Adelaide theatricals some months later. We bumped into my grandparents during interval, and I still recall my grandfather’s silence, which took me many years to really understand. 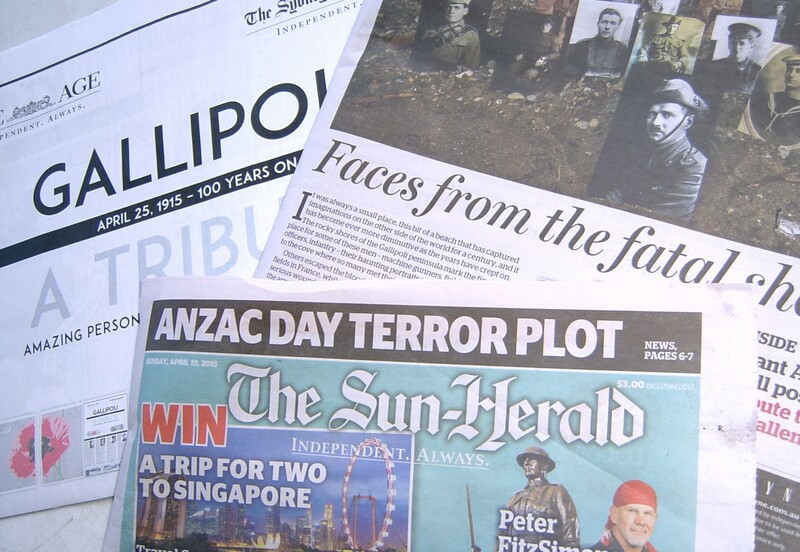 The One Day of the Year is a clash between father and son over Anzac Day celebrations. By the 1950s, the national holiday (25 April) had come to represent drunken diggers (by then, veterans of at least three wars). Anzac day officially commemorated the failed and deadly campaign by Australian and New Zealand troops sitting helplessly from 25 April 1915 to 9 January 1916 on the Gallipoli peninsula in Turkey. What were they doing there? A good question. Encouraged especially by Prime Ministers Bob Hawke and John Howard, Anzac Day has in recent years become a massive, national festival. Thousands clamour for the limited tickets to the dawn service at Gallipoli itself. On the eve of this year’s centenary of the landing, our unpopular Prime Minister Tony Abbott urged everyone to get to a dawn service to show “our defiance of those who would do us harm [read “terrorists”] and we’re supporting our country’s [newly-invented “Judeo-Christian”] values and our armed forces [including those I am now sending back to Iraq]”. Some veterans would never go near such a bun fight, including my grandfather, who was awarded a Military Cross and endured a year’s surgery that still left metal in him. The death and destruction were sufficiently painful that he left London in 1922 to live in South Australia, never to return. “It was all about the killed and the killing.” When he had to lead his men “over the top” from the trenches in the Somme the majority were killed. He and one other were wounded and lying in the mud for 48 hours before being rescued. … he said he had to live with that, knowing how many men were killed and that the action had not been of any value. In South Australia, he became the much-loved General Manager of the SA Housing Trust, and retreated into writing “escapist” plays and a musical, several performed. Alex’s son, my father, went off to the Second World War and only ever attended Anzac commemorations as a radio commentator. But he was beaten in any contempt for arms by my mother, whose two brothers had been psychically damaged, one of them a young fighter pilot who became a problem alcoholic, and who always went to Anzac Day reunions. In fact, when unable to work and living with us, he went to daily reunions. He was a lovely guy, his life ruined and shortened. I could hear my mother’s anguish when I read the other day how all “9 acres of guns” had to be made non-operational, with the firing pins removed, at the annual convention of the right-wing front-group, the U.S. National Rifle Association. That’s the NRA that wants loaded guns in schools to protect from guns – a policy of “mutually assured destruction” (or MAD). A libertarian Senator believes Australia is a “nation of victims”, unable to protect themselves with weapons. He spoke in response to the Martin Place siege, in which two hostages were killed, one by police fire. Leyonhjelm’s case seemed even sillier when, a few days later, in a Walmart in Idaho, a two-year-old killed his mother with her gun that he found in front of him in her shopping cart. From the killing rates, the highly armed U.S. is by far the greater “nation of victims”. Whatever way it came down to me, I was left loathing militarism, an opponent of the Vietnam War, another distant venture to which a conservative Australian government sent young citizens. When I say “citizens”, 20-year-olds were conscripted but we had to wait another year to vote. It’s the half-century anniversary of that, too, by the way. This present Anzac carry-on is not all chauvinist belligerence and calls for more “defence” spending. I have tried to avoid media coverage, but it is wall-to-wall, and I have found plenty of genuine sorrow for the killed, maimed, and forgotten. The notable absence, however, is discussion about how to end the barbarity. Where’s the pacifism? From my reading, many libertarians genuinely oppose war. The “free” (ha-ha) market is the only legitimate power, they believe, making the military as invalid as any other non-market force. They manage to ignore, however, enormous “market” pressures from the military-industrial complex that President Eisenhower warned against in 1961. They also detest world government, which I am not convinced might not be an improvement on self-appointed sheriffs in continuous action (Groundhog Day meets High Noon). Not very gastronomic, I hear you say. Where are the meals? Yes, that’s the point. You may call it escapism, but I retreat from the horrors of war and unlimited growth (more on another occasion) to meals. Meals matter, and importantly as a rejection of armaments. Meals are the antithesis of war. Enemies make peace at the table. The genuinely free market is not going to spontaneously combust. The land flowing with milk and honey is no scorched earth. I contemplated such matters when planning my small birthday dinner on what also happens to be Anzac Day. It’s also the 50th anniversary of conscription for Australian males turning 20, as mentioned earlier. It should be an anti-armaments dinner, I decided. But meals are intrinsically anti-armaments, swords left at the door. 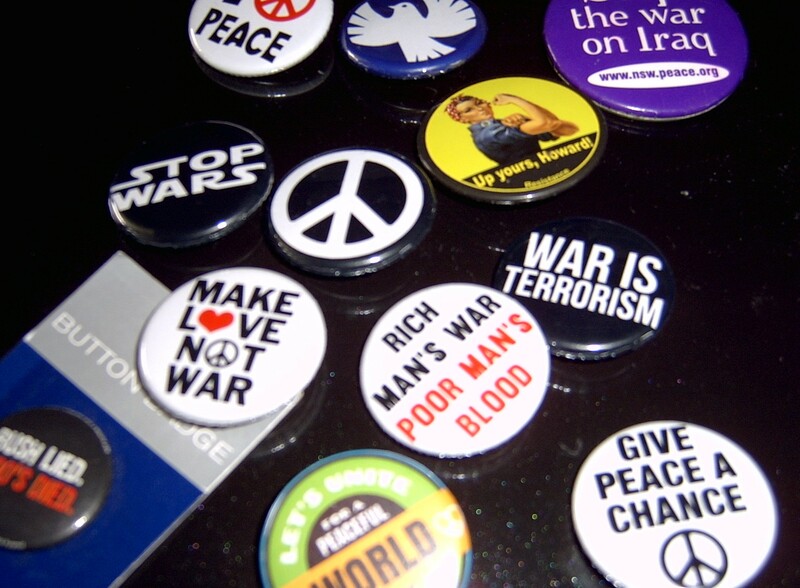 So, I’ve just collected some anti-war buttons to be worn by diners who want. “make dinner and talk” around the table in the global sense as well as in private to combat militarism. the nationalism in Abott’s call to attend the Dawn service is appalling.